Comic books. You know, "funny books". Yes, I collect them. I enjoy them. And they're not what a lot of people imagine them to be. They range from funny to eclectic, serious to downright not for kids. Comics I've enjoyed immensely include the Pulitzer Prize winning Maus, the Neil Gaiman series Sandman, Elfquest by Wendy & Richard Pini, and I enjoyed "The Legion of Super-Heroes" for years. 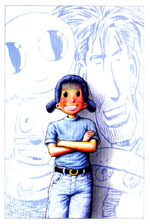 In the past few years, two comics that have really piqued my interest are “Akiko” and "Bone". This is Akiko. I named my dog after her. She's the star of a really neat comic, called, interestingly enough, "Akiko". Just think of a fourth grade girl who has adventures in outer space. Yes, really. It's a lot of fun. You can find out more at the Akiko site, which is run by the author, Mark Crilley. Better yet, check out the Akiko fan club – where there is a bunch of discussion about Akiko! You won't go wrong with trying out this comic. It is a prime example of why I enjoy comics, even at age 46. I also highly recommend "Bone". It is available in a lot of places, and it has been reprinted in some compilations. 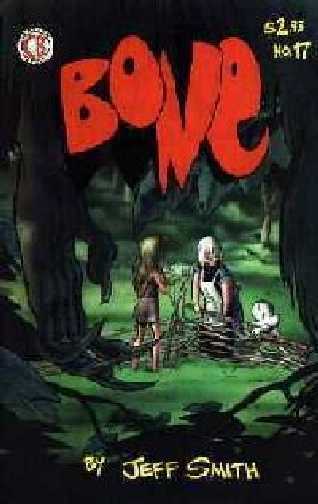 You can check out "Bone" on the Internet at Boneville! By the way, I include the cover of Bone 17, because I had a letter published in that issue. To see the letter, you have to get THAT cover, because other #17 reprints don't have it. Or, you can see the letter by clicking here. 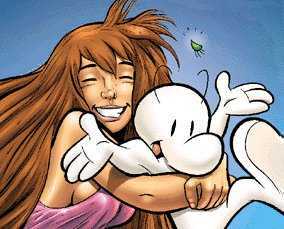 As always, I'm sure the pictures above are copyrighted and all that, but I certainly hope that Jeff Smith and Mark Crilley don't mind that I included them and praised them. If there are objections, I'll of course remove them immediately.